Yet another story from Maruti boosting up the morale of diesel car buyers in India, a Swift Dzire automatic is spotted testing near the facility in top-end diesel variant (ZDi). Spotted clearly from inside out, none of the cues slipped externally to convey it as AMT by means of badges or so. Nor even interiors do speak a lot about the new transmission. It’s only the gearbox which is found solely speaking for itself. However, the car portrays clearly about its new gearbox inside the cabin, whereas the sources had also spied WagonR and WagonR Stingray with the AMT transmission some days back, and strongly speculate the Swift to also follow this suit. 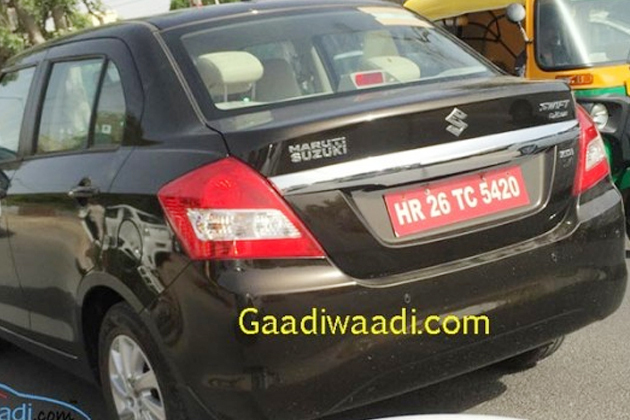 Thus, before any of them makes way to public, it seems the India’s best selling C-segment sedan, Dzire, will make to the launch pad, as it appeared completely finalized with nothing remained to do away at the test. Hence, in the engine bay the feed of power to this Dzire AMT is tempted to move from the existing 1.3-L Multijet diesel engine of 75bhp and 190Nm of torque. The new looks of Swift had brought only small and negligible changes to the face, whereas the rear is a lot identical to the past model. This new addition at the festive launch may raise the excitement for an additional amount of Rs 35-40k than the standard variant. Hence, keeping fingers crossed. Maruti is on vengeance to strike back with AMT in very possible model, will turn interesting to see how the market will respond to this new trend of driving.